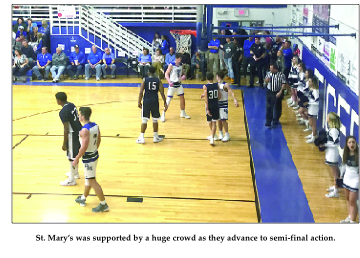 Saint Mary’s faced the Houma Christian Warriors at home Thursday night in quarterfinal action. Winner punches a ticket to the semifinal game played next week in Lake Charles for Marsh Madness. The Warriors advanced past Opelousas Catholic to play the host Tigers coming off a Monday night victory over Westminster Christian. The first scoring of the game came on an inbounds pass under the basket to Thomas Howell who kissed the ball against the glass to score and was fouled in the process. He would convert the foul shot to get an old fashioned three and put the Tigers on the score board. Tre Washington committed two early fouls and the big Warrior would have to be careful with his play. T. Howell was guarded by Washington and the two played tough inside basketball. The referees would not allow much physicality as they called many early fouls on both squads. The first quarter score had the Tigers leading 15-9. T. Howell had a repeat performance on a low post play laying in an easy shot off the glass and again hitting the And One after a Warrior foul. At the 3:26 mark #23 JeCorie Ward got called for his third foul. Trent Washington would avenge the call with a coast to coast trip and a slam dunk over 6 foot, 7 inch Thomas Howell. Howell answered that with a rebound put back rim rattling jam with the clock showing 1:12 in the second period. Saint Mary’s took a 30-17 lead into the half time break. Thomas Howell had 14 first half points. Houma Christian opened the second half with the ball but turned it over to the Tigers. Parker Bankston goes to the goal and stops at about 4 feet out and jumps into a Warrior defender to try and draw a foul but is not rewarded for his efforts. Bailey Shelton would be successful on a baseline 3-point shot and things were looking good for Saint Mary’s. #22 Trent Washington tried to drive the left side of the lane but is met by Howell who swats his attempt out of bounds. No way was the big man going to allow a repeat dunk by Washington. The quarter ended with the Tigers leading 39-25. Three minutes would tick off the clock before Saint Mary’s could score in the fourth period. Bankston is fouled and makes his charity shots count to make the score 41-26. The Warriors were able to knock down a 3-ball and try and close the gap. The score is 43-32 with 2:03 to play and the Warriors elect to send the Tigers to the free throw line to save time and get possession of the ball. Trent Washington fouls Jared Elie and he only makes the back end of his two shots. The Warrior technique allows them to get the game as close as nine points. Saint Mary’s inexplicably fouls the Warriors on several trips down the court and Elie fouls out with 1:05 to play. With 58 seconds, Trent Washington fouls Shelton and he sinks both shots. Score is 50-38. With 47 seconds on the clock Wes Spry goes to the goal for the Warriors and can’t get a shot to fall. Aaron Howell gets the rebound and sends it to Bankston who is fouled by Deshaun Jones. Another 20 seconds would elapse before T. Howell is sent to the free throw line, but he can only drop in one shot. The Warriors do get a 3-point shot to fall and the score is 51-41. Houma Christian tries another long three and it is no good. Patrick Walker gathers up the rebound and is fouled. The senior is clutch making both shots and the Tigers emerge with a victory propelling them to the semi-final game. Tigers win with a final score of 53-41. The student body rushed the court and the Tigers cut down the nets. They will play the winner of the Hamilton Christian vs. St. Martin’s Episcopal game with a trip to the State Championship on the line.